One of the questions NFL teams ask about quarterback prospects is, can he make all the throws? 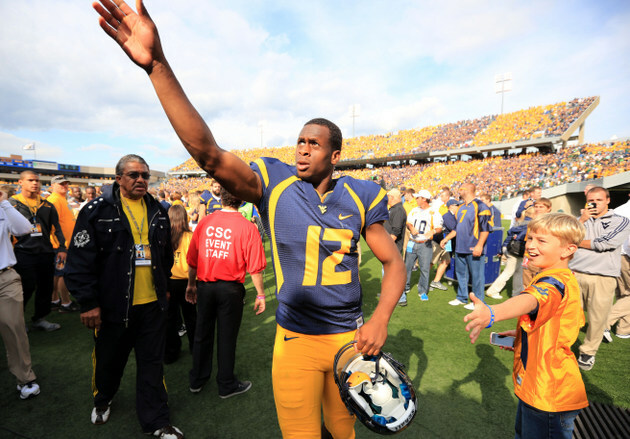 West Virginia quarterback Geno Smith made every throw against Baylor. In fact, he went through the whole passing tree in the first half. And then he went through it again in the second half. Whether he was throwing deep posts, precise out routes or a perfectly thrown fade route to the corner, Smith had one of the best performances against a ranked team that anyone has ever seen in a 70-63 win over Baylor. Has a Heisman Trophy race ever been decided by the end of September? Smith completed 45-of-51 passes for 656 yards and eight touchdowns against Baylor. Throughout the day he displayed a great combination of velocity, touch and accuracy, as well as having a great feel for when to tuck the ball and run for a first down. Smith now has 20 touchdowns and no interceptions this season. No other player is realistically in the Heisman picture right now, and NFL teams have to be rapidly moving Smith up their draft boards. He doesn't seem to have many flaws. Some team is going to land a nice franchise quarterback next April. But Smith still has a lot of work left to do for West Virginia, and he has a chance to turn into a Jimmer-like phenomenon for college football. Smith has a fantastic narrative that more fans will start to learn, having chosen football over being an art student, another field in which he was gifted. Smith is remarkably intelligent, makes creative plays on the field that are uncanny and has the backing of a rabid fan base that will help grow his legend. That total package is enough to perhaps make Smith the dominant and enduring storyline of the 2012 season. Just like Jimmer Fredette took over the college basketball world in 2011. Every game Smith plays from here on out should become a must-watch game for any football fan. That includes Sundays for the next dozen or so years.